You might be surprised to learn that fashion trends aren’t confined to the catwalk, especially not where Christmas is concerned. Each year, glossy lifestyle magazines and the big high street stores stores step-up with even more outlandish and desirable styles that us consumers ‘just gotta have’. John Lewis sets the pace for Christmas with its eagerly anticipated TV advert, often featuring their trademark immaculate home interiors. 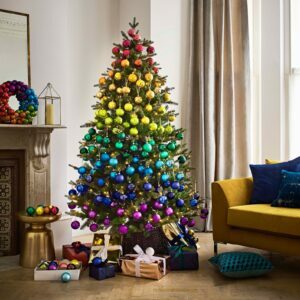 This year, it has tipped the rainbow Christmas tree as the ‘must-have’ seasonal trend for our living rooms. So, why are John Lewis backing the rainbow tree? Well, it’s identified the sheer shareability of this trend – with people taking to social media in their droves to show off their colourful creations. For us mere mortals, an added bonus is the fact we can incorporate decorations we already own into the scheme making a great value for money look too! 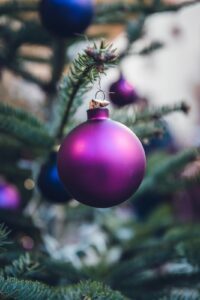 Jewel tones aren’t really new when it comes to Christmas being loved by many of us already, but 2018 sees a more decadent and dark re-imagining of this traditional colour scheme. Inspired by tropical rainforests and the midnight sky, jewel tones for 2018 will evoke a really sumptuous living space. Deep ruby, emerald, amethyst and sapphire shades can be used singularly for a luxe effect, or blended for a really rich result. Whilst the tree is the undisputed centrepiece of any Christmas room, opulent table runners, chargers and napkins will compliment the scheme beautifully and dress a luxurious table fit for a feast. Scrooges and goths will have their chilly hearts warmed by this all-black colour scheme, and not just black, but matte black. It might seem a little cheerless, but it’s a really bold statement that can be blended with some traditional Christmas sparkle and your existing decorations for greater impact. 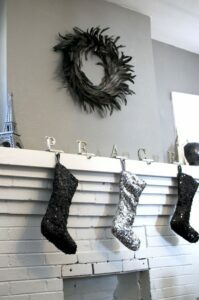 We think black is so stylish and edgy; it’s sure to create a talking point with yuletide visitors. Do traditional Christmas themes leave you feeling uninspired? Does the gloom weather have you dreaming of sunnier shores? Try something completely different, like this cheerful, tropical Christmas theme. This quirky trend infuses summer colours and holiday vibes into whimsical decorations: think pink flamingos, golden pineapples and aloe-green cacti. Sass and Belle and Paperchase are stocking some gorgeous decorations on the theme but you can craft some yourself at very little expense! Use Hawaiian leis in place of tinsel and decorate a Christmas wreath with cocktail umbrellas instead of baubles and holly. From the richness of jewel tones and the flamboyance of rainbows, to the swank of bold black and the novelty of a tropical Christmas, December has never looked so cool – or should we say hot? !